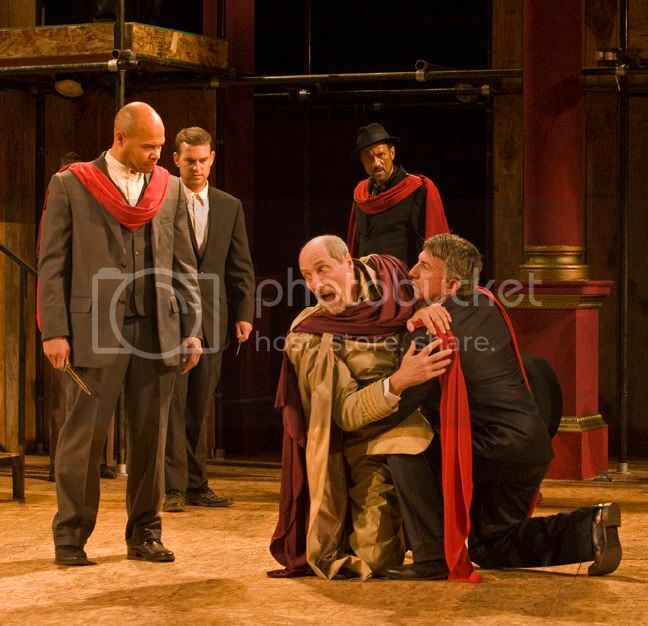 Chris Butler (Cassius), Aaron Walker (Cinna), Matt Gottlieb (Caesar), David A. Moss (Casca), and Scott Wentworth (Brutus) in SSC's 2009 production of Julius Caesar. In order to be totally honest and forward with my review, I have to admit that we finished watching HBO's "Rome" about two weeks before we attended Julius Caesar. It feels a little tawdry to say that the Bard is competing with HBO, but let's face it. With the "All Roads Lead to Rome" special feature on, Andrew and I learned all sorts of interesting historical tidbits, along with the ... historical interpretation that HBO did. We saw the play with HBO-colored glasses on. Neither Andrew or I had read Julius Caesar (somehow, in school I read Hamlet five times, Taming of the Shrew thrice, but never Julius Caesar), so we went in with a blank slate. With Shakespeare's work, this is sometimes good, and sometimes... less good. In this case, we already had a peripheral knowledge of the storyline and characters. We all know how this play ends, so I really don't need to do a spoiler alert, right? Let's start with the basics: minimalist staging and modern dress, which I really like. There is also nothing that compares to sitting in a grove of redwood trees, watching excellent theater, bundled up and snuggling with your date. Saying that the writing was excellent seems foolish, so let's focus on the actors- which are what really makes or breaks the performance of a classic work. Julius Caesar was played by Matt Gottlieb, who was particularly commanding in the role, but when playing across from Calpurnia (Emily Kitchens) there was a genuine softness that really speaks to the talent of the actor. The other really standout actor was Scott Wentworth, who played Marcus Brutus. Wentworth boasts a beautiful baritone voice that carries across the glen with no need of amplification, and an enviable acting range. The audience follows along through his good intentioned beginning (to take down a tyrant) through the reality of having slain his friend, to his own tragic end. Despite the fact that the histories are not my favorites of Shakespeare's work, I would still give this show two thumbs up. The acting is stellar, the setting is divine, and watching well-performed classics is always enriching.